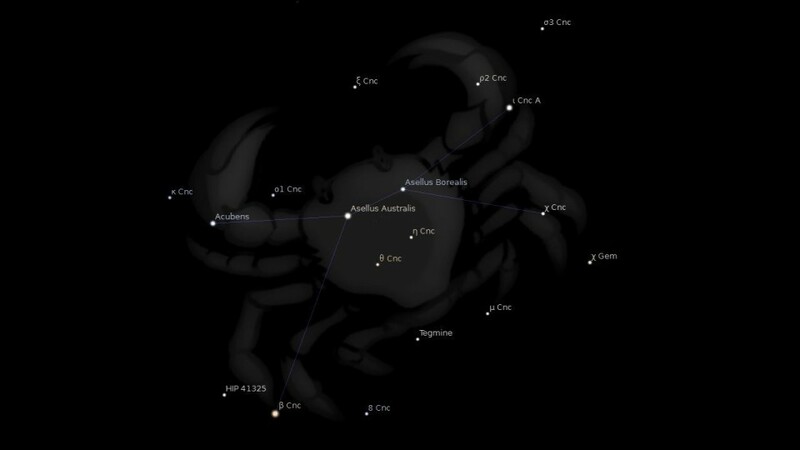 Constellation Cancer the Crab, is an ecliptic constellation laying between constellation Gemini and constellation Leo. It spans 14 degrees longitude in the zodiac sign Leo. The Cancer constellation contains six named fixed stars. 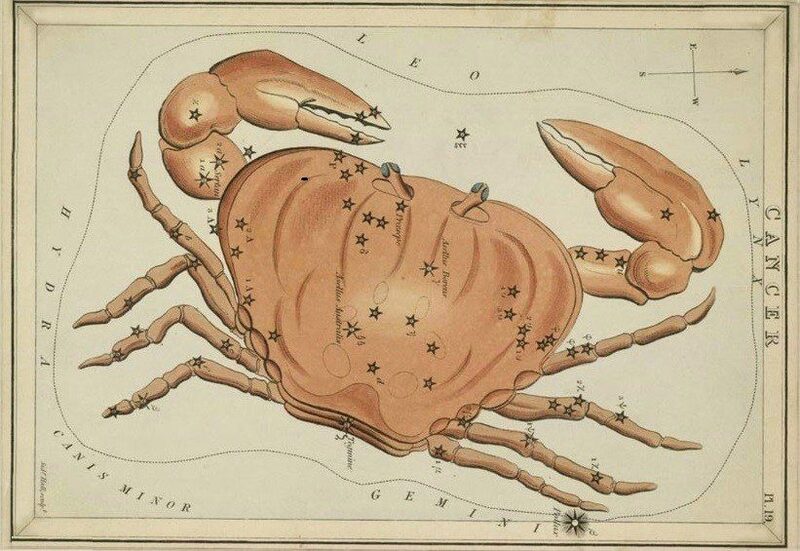 This constellation represents the crab that bit the heel of Hercules during his fight with the Lernean Hydra, and was placed among the stars in gratitude by Juno, the enemy of Hercules. Cancer, the Crab…lies next to Gemini on the east, and is popularly recognized by its distinguishing feature, the Beehive, ancient Presaepe… It is the most inconspicuous figure in the zodiac, and mythology apologizes for its being there by the story that when the Crab was crushed by Hercules, for pinching his toes during his contest with the Hydra in the marsh of Lerna, Juno exalted it to the sky; whence Columella called it Lernaeus. Yet few heavenly signs have been subjects of more attention in early days, and few better determined; for, according to Chaldaean and Platonist philosophy, it was the supposed Gate of Men through which souls descended from heaven into human bodies. With regard to the sign of CANCER, one thing is certain, that we have not got the original picture, or anything like it. It does not agree with the names either of its three constellations which have come down to us, or of its stars. In the ancient Denderah Zodiac it is represented as a Scarabaeus, or sacred beetle. * In the Zodiac of Esneh and in a Hindu Zodiac (400 BC) it is the same. * The Scarabaeus, passing its early existence as a worm of the earth, and thence issuing as a winged denizen of heaven, was held sacred by the Egyptians as an emblem of the resurrection of the body. According to the Greeks, Jupiter placed this Crab among the signs of the Zodiac. In Sir William Jones’s Oriental Zodiac we meet with a crab, and an Egyptian Zodiac found at Rome bears also the crab in this sign. The more ancient Egyptians placed Hermanubis, or Hermes, with the head of an ibis or hawk, as the symbol of the sign now allotted to CANCER. The Denderah name is Klaria, or the cattle-folds, and in this name we have the key to the meaning of the sign, and to the subject of this chapter. The Arabic name is Al Sartan, which means who holds or binds, and may be from the Hebrew to bind together (Gen 49:11). There is no ancient Hebrew word known for the crab. It was classed with many other unclean creatures, and would be included in the general term “vermin.” The Syriac, Sartano, means the same. The Greek name is Karkinos, which means holding or encircling, as does the Latin, Cancer, and hence is applied to the crab. In the word Khan, we have the traveler’s rest or inn; while Ker or Cer is the Arabic for encircling. The ancient Akkadian name of the month is Su-kul-na, the seizer or possessor of seed. The sign contains 83 stars, one of which is of the 3rd magnitude, and seven are of the 4th magnitude, and the remainder of inferior magnitudes. In the center of the Sign there is a remarkably bright cluster of stars, so bright that they can be sometimes seen with the naked eye. It looks like a comet, and is made up of a great multitude of stars. Modern astronomers have called it the Beehive. But its ancient name has come down to us as Praesepe, which means a multitude, offspring. 1. Fixed Stars and Constellations in Astrology, Vivian E. Robson, 1923, p.33. 2. Star Names: Their Lore and Meaning, Richard H. Allen, 1889, p.107-111. 3. Astronomica, Manilius, 1st century AD, book 4, p.235. 4. The Witness of the Stars, E. W. Bullinger, 35. Cancer (the Crab).